This week I am participating in Rachel Harrie's platform-building campaign. So if you're here for that, Welcome! My writing is coming along slow and steady. I've updated my writing status bar to your right to show my progress on the re-write. That way you guys can poke me when I'm not doing anything. That's pretty much it on the news front so I'll leave you all with one of my long-time favorite songs. It's one that never grows old to me. What goals do you have this week? Hey - fellow Campaigner here - and I scrolled down and read your Monday post. Heartbreaking. I will put that family in my prayers. Hi, Just another campaigner stopping by to say hello. Can’t wait to get stuck into the writer’s campaign. I scrolled down to read your Monday and I'm so sorry to hear that happened to your friends' family. I'll keep them in my thoughts. As for myself, I'm currently working on some pre-writing for my WIP. So my goal for the week is to finish that up! @K.M. - Thanks for stopping by! Thanks for posting this song!! I am totally using it for my current WIP, I'll listen to it when I'm doing revisions, it has angels in it. ;0) Oh, and thanks for the words of encouragment on my site! This Campaigning this should be fun. I love that song! It is great inspiration for writing. Prayers go out to Johnny and his family. May they find peace. Man, is everybody and their mother doing this? I gotta get on board! @Jenny - That totally works with your book then :) And you are so welcome, I think your awesome! @Krista - It's so great isn't it? @Amanda - Welcome! I have the same goal, but all these fun people are just so darn distracting! @Jessie - yes, you are way behind the curve, now get on it!! 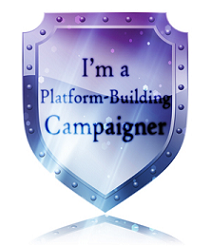 YAY for the campaign builders! It is really getting huge. I'm so glad you are doing it too! As for my goals this week... I think I am just hoping to survive the week! JK. I need to get badges put on my sons scout uniform, take the kids to Back to school night and run one of the booths, make sure to blog and get 10K done in my novel. Visit with an online crit group and another crit group both on thursday night. AGH. See what I mean about surviving? Hello from the campaign trail! I will be doing a brief introductory post Thursday for my fellow campaigners. I didn't know Jimmy Eat World did slow songs. I always heard their faster rock ones. Learn something new every day! like the song. Good voice. So awesome. This is going to be monster. Great song! Thanks for posting. Fellow campaigner and and fantasy group member stopping by to say hi. Hi! How does the world go on? Have You Ever Lied About Your Goal Progress? A Cookie For Your Thoughts?